grandma's cookie jar: Why Children's Museums are Beyond Fun! When you think about museums, you likely think about places where you go to see things, but where you are not allowed to "touch" those things. This is just the way it is with museums . . . unless you are talking about children's museums! While you certainly go to children's museums to see things, you are allowed to - and even encouraged to touch, play with, explore and enjoy the things you find at a children's museum! Talk about fun!!!! So, what are just some of the things you might find at a children's museum? Look at the following . . . Bubble Rooms! 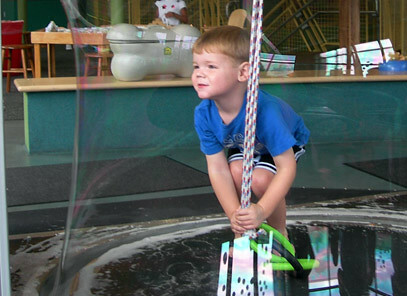 What child wouldn't absolutely LOVE the opportunity to stand INSIDE a giant bubble?!!!! I know a lot of adults who would LOVE this, too! Rocket Rooms! Learn about and build rockets! You don't have to be a "rocket scientist" to enjoy learning about and flying rockets! Recycled Fairy-tales! Everyone loves a good story now and then! Inventions - learn about inventions and create your own inventions! Everything was a "new" invention at one time . . . learn about inventions and try creating your own "new" invention! Space and Science projects to actually do with your own hands! Stars, planets and science projects . . . sounds like a lot of fun! Backyard exploration - because sometimes you'll find amazing and unexpected things right outside your back door! Machines - you don't have to drive or work big machines to find them interesting! Try building a few of your own machines, too! Farms and animals! Learn about animals, care for some and take a look at things which grow on farms . . . some of which are very tasty! And so much more! Not all children's museums have these exhibits, some have other exhibits, but they all have places where children are able to learn by touching, experiencing and by doing! They are places where there is talking, moving, discovering and lots of laughing! What isn't there to love about children's museums?!!! So . . . because I love children's museums, I thought it would be great fun to plan a "Children's Museum Tour"! The month of August I'll be sharing readers' experiences at children's museums across the country and I'll be giving away passes to children's museums! To make this work, I need some volunteers to visit children's museums. I have passes to some children's museums across the country - I'll post the name and location of these children's museums and then I need someone to volunteer to go visit the museum with their grandchildren/children - I'll provide four passes for you to do this. Then, after you visit in July, just email me a few sentences about what you liked the best and what your grandchildren/children liked the best so I can share your experiences in the month of August when I'll be giving away more tickets to the children's museum! It will be lots of fun! Please help me out by checking the list below of locations where I have passes and need someone to volunteer to visit - someone who is willing to let me know about their visit. If you are willing to volunteer, please comment below and tell me which museum you'd be willing to visit and email me at lyndafreemanatcd@gmail.com so I can get your address to mail your passes to you. I have more children's museums where I'll be needing volunteers, so please keep checking back and if you live in, near or will be visiting any of these places, please volunteer to visit the children's museum!